Recently there has been an effort to reintroduce the "prepless" or "minimal preparation" veneer. The primary driving force has been a marketing effort suggesting that patients' smiles can be drastically improved without using the "dental drill, shots or removal of healthy tooth structure." Consequently, dentists often have been forced to utilize a prepless veneer at the request of their patients, despite the fact that the treatment might be contraindicated. Another important compromise is that many clinicians are unaware of (or unfamiliar with) indications in which eliminating teeth preparation may be an option. Because of this, the dental industry has seen a rebirth of over-contoured and bulky smile designs using ceramic veneers. This has lead many to believe that the prep-less veneer option should not be considered because of the inability to achieve acceptable esthetics. 1. 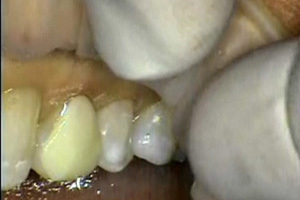 Understand why the prepless to minimal preparation veneer should be considered. 2. Describe the steps in the smile design process. 3. State the information that needs to be communicated to the lab. 4. Describe the steps in the cementation process.